The Environmental Protection Agency reportedly has decided not to set legal limits for the toxic fluorinated chemicals PFOA and PFOS in drinking water. The news is deeply disturbing, because an estimated 110 million Americans' water may be contaminated with those cancer-linked compounds or others in the chemical family known as PFAS. But there is another group of Americans threatened by PFAS chemicals – and they haven’t yet been born. Since then, multiple international studies have confirmed our findings. Most recently, in 2016 a Canadian study found PFAS chemicals in more than 90 percent of the nearly 2,000 cord blood samples collected from pregnant women. * PFAS concentrations measured in whole blood in nanograms per gram of wet weight. Not long ago, scientists believed the placenta shielded umbilical cord blood – and the developing fetus – from environmental pollution. 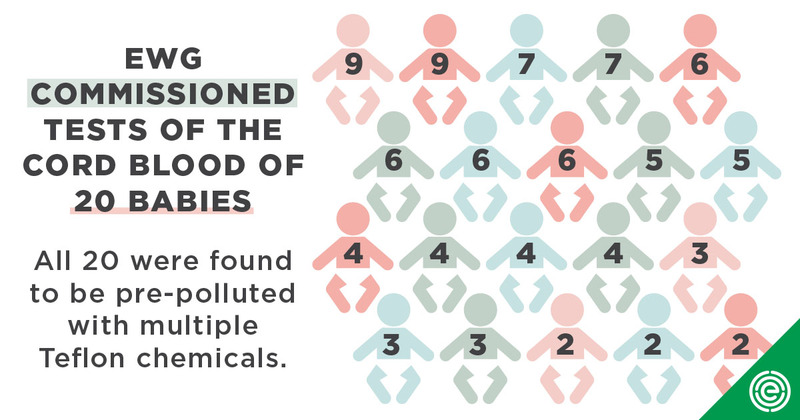 But EWG’s research and other studies show that during this critical time of development in the womb, the fetus is already exposed to scores of industrial chemicals. Exposure to PFAS chemicals comes from many sources – not only drinking water but also food and food packaging, some brands of waterproof clothing and even cosmetics. The extent of drinking water and environmental contamination is only now coming to light, decades after widespread manufacturing of PFAS-containing materials and products. EWG research estimated that PFAS contaminants may be in the drinking water of 110 million Americans. The list of PFAS chemicals that EWG tests could detect are just a small fraction of the thousands that have been in use worldwide. PFOA and PFOS are now banned in the U.S., and their levels in people have been dropping, according to CDC biomonitoring studies. Meanwhile, replacement PFAS chemicals have come on the market, such as the GenX chemical, which is about as toxic as PFOA. Add PFAS chemicals to the Toxic Release Inventory and require monitoring of PFAS in air, water and our children’s bodies. Ban the introduction of new PFAS chemicals and end the use of PFAS in firefighting foams and in consumer products like cookware, food packaging and personal care products. Set tough science-based cleanup standards, require water utilities and military installations to meet them, and make sure polluters pay their fair share of the cost. In his confirmation hearing to be EPA administrator, Andrew Wheeler, currently the acting head of the agency, told the Senate Environment and Public Works Committee that EPA would announce plans soon to address the widespread contamination of the nation’s tap water with PFOA and PFOS. But two sources familiar with the upcoming decision by Wheeler told Politico the Trump administration will not set legal limits for PFAS under the federal drinking water laws. To protect all Americans, including newborns, the EPA and the Food and Drug Administration should strengthen its oversight of the entire PFAS family. Allowing the introduction of PFAS chemicals without adequate testing and regulation amounts to letting the chemical industry use the American people as guinea pigs.